An evening pause: Orchestration by Maurice Ravel. Performed in Carnegie Hall, New York, July 22, 2014 by the National Youth Orchestra of the U.S.A. This long for an evening pause, but it is worth listening to every note. Embedded below the fold. We talked a great deal about the failure of Schiaparelli, and the apparent dispute within ESA about it. Nancy Pelosi has fought off a challenge to her position as the House Democratic leader, winning 134 to 63. Considering how badly the Democrats have fared in elections under her leadership, her victory here indicates strongly the bankrupt state of the Democratic Party. They seem unable at all to accept any blame for their losses, which would be the first step in reforming their increasingly corrupt party. Instead, they have been doubling down on the same rejected leftwing and race-based policies. Note also how the Democratic Party has become entirely dominated by its urban and coastal regions. While those areas have become almost one-party states run unopposed by the Democratic Party, their influence is very regionally limited and has been strongly rejected by most of the rest of the country. Even so, the Democrats continue to pick as their leader an extreme leftist from the extremely leftist San Francisco area. None of this bodes well for either the Democratic Party, or the nation on the whole. To have a healthy democracy you need a healthy opposition party. Right now we do not have it. The Russian government has now allocated a new budget for the next phase of construction at its new spaceport at Vostochny. “The money has been allocated and specified by Prime Minister Dmitry Medvedev for 2017-2019 within the limits of about 25-30 billion rubles annually, i.e. these funds are not as large as it seemed to us earlier,” the vice-premier said. “These funds have been set aside on the basis of the so-called ‘optimal scenario’ proposed by [State Space Agency] Roscosmos,” Rogozin said. Essentially, they have lowered the budget and pushed back some of the more costly construction at Vostochny until after 2019. Even with these trims, they also note that the budget will still depend on how the Russian economy does in the coming years. The competition heats up: In a continuing re-organization to cut costs, Airbus yesterday announced plans to slash 1,164 jobs. The initiative is part of [Airbus Chief Executive Tom] Enders’s four-year campaign to reshape the business in the wake of the failed attempt in 2012 to merge with BAE Systems PLC, Europe’s largest arms maker. After the deal with BAE faltered on German government opposition, he won shareholder backing for a new structure that reduced French, German and Spanish government involvement in company decision-making. The old structure was a legacy of the founding of the company in 2000 through the combination of European aerospace and defense assets. Airbus in 2013 moved to merge its defense and space assets and shed some operations not central to its aerospace business. This approach matches very well with the company’s joint partnership with Safran and their hard-nosed insistence that they own and control Ariane 6. They are pushing to get the government bureaucracy out of their business so that they can work more efficiently and make more money. The Trump transition team has named its first member whose focus is NASA. The pick is Chris Shank, who worked under Mike Griffin during the last Bush administration and has more recently been a staffer at the House science committee. Shank is an experienced space policy professional. From 2001-2005, he served on what was then the House Science Committee staff specializing in human spaceflight and Earth science issues. After joining NASA as a special assistant to Griffin in 2005, he was appointed NASA’s chief of strategic communications in 2008. He left NASA in January 2009 at the end of the Bush Administration and worked first at the Applied Physics Lab and later Honeywell Aerospace. He returned to Capitol Hill in 2011 as Deputy Chief of Staff to Rep. Lamar Smith (R-TX), who is now chairman of House SS&T, and in 2013 was appointed policy and coalitions director for the full committee. But Price’s stance on biomedical research issues is harder to parse. He has taken few public positions on science, but has consistently pushed to cut overall federal spending. Last year, he voted against a bill that would overhaul FDA regulations and provide US$8.75 billion in mandatory funding to the NIH over five years. There was once a time where Price’s approach would have been considered plain common sense. In today’s mad leftwing world however the idea that resources are not unlimited and that people have to make careful choices is considered evil and anti-science. Expect these kinds of attacks to continue nonstop throughout the entire Trump administration, especially if that administration and Congress continue to push for a bit of restraint on budget issues. This is what happened during Reagan’s first term in the 1980s. The result was that eventually Reagan was never able to trim costs or eliminate any federal agencies, as the attacks caused many of his more radical cabinet picks to resign and the Republicans in Congress to eventually back down. Today, however, things are different in one major way. Then, there was no alternative to the liberal press. Today, there are such alternatives. Moreover, the bias of the liberal press today is much more evident. Many more people recognize it, and do not take their howls of indignation as seriously. If Trump and the Republicans have some courage and do not back down, they can win this battle. All it will take is some courage. We shall see if they have it. The competition heats up: ULA today announced the creation of a new website, dubbed Rocketbuilder, where customers and the public and configure their own launch rocket. This is great news, as it shows that Bruno and ULA are very serious about competing aggressively with SpaceX. For example, Bruno notes that the price of the cheapest Atlas 5 configuration has dropped from $191 million to $109 million in the last few years. And while this price remains significantly more expensive than SpaceX’s $62 million, this new tool should help to drive the costs down more. When ULA learns which configurations sell best, it will then be able to make those configurations cheaper. The site is also cool. I tried it, and found that it strongly resembles the experience of buying an airplane ticket at sites like Travelocity. You pick various options (payload weight, payload size, orbit, etc) and the site automatically adjusts the rocket’s configuration and the price. The competition heats up: In 2016 it appears that the United States will complete the most rocket launches, at 20, followed by China with 19 and Russia with 18. For the past two decades Russia has generally been the yearly leader in launches, but recent competition from the U.S. private sector and China’s surging government program, combined with lagging quality control problems and budget shortages in Russia, has had their launch rate decline to third. I also fully expect the U.S. lead to grow in the coming years as a range of low cost new companies come on line. The competition heats up: A new Chinese launch company aimed at putting smallsats in orbit for a low price has signed its first customer. In a statement published by China Daily, Zhang Di, vice president of the China Aerospace Science and Industry Corp. (CASIC) Fourth Academy, said Expace Technology Co. would charge around $10,000 per kilogram of satellite payload, which he said was less than half the prevailing commercial price. Zhang is also chairman of Expace. CASIC created Expace in early 2016 as China’s second commercial-launch provider after China Great Wall Industry Corp. of Beijing, which has long been China’s showcase export vehicle for launches and commercial satellite contracts. China Great Wall is part of the China Aerospace Science and Technology Corp. (CAST). Zhang said Expace has already signed its first commercial contract, valued at 100 million Chinese yuan, or around $14.5 million, to place three Earth observation satellites into low Earth orbit aboard a Kuaizhou 1 rocket for the government-owned Changguang Satellite Technology Co. This same company has more than 10 other satellites slated for future launches on Kuaizhou rockets. The situation here is interesting. This small company is essentially competing against China’s big space company that builds that country’s Long March rockets. It is also aiming to capture some of the market share of the new smallsat industry, specifically targeting international satellite companies that are becoming less and less dependent on the U.S. rocket components that would forbid their use on a Chinese rocket. Part Time Scientists, one of the teams competing for the Google Lunar X-Prize, has secured a launch contract through launch rideshare broker Spaceflight Inc.
Their rover will launch as a secondary payload. It is the broker’s job to secure that slot. The landing site has been chosen to be within reach of the Apollo 17 site, but not so close that it could risk damage to the NASA preservation heritage area. “We want to land 3 to 5 kilometers [2 to 4 miles] away from the [Apollo 17] landing site,” said Becker. This team is now the fourth X-Prize team to secure a launch contract. All are hoping to launch within the next two years. The House Republican majority leader Kevin McCarthy (R-California) today said that their partnership with Trump will allow them to ignore the conservative Freedom Caucus. Majority Leader Kevin McCarthy signaled that Republican brass doesn’t plan to kowtow to the conservatives anymore. Ryan’s No. 2 predicted that it’ll finally be the other way around. The group will be forced to fall in line. During a forum hosted by The Washington Post, McCarthy forecasted a less influential Freedom Caucus, a bolder GOP leadership team, and a more unified GOP conference. Altogether, the California Republican explained, “you’re going to see us sticking together more.” That’d be a significant change from the last two years. …Famous for making deals, Trump won’t worry about reaching across the aisle to compromise with Democrats. For the pragmatic president-elect, bipartisanship is a bonus, not a liability. The threat of losing 35 members of the Freedom Caucus won’t fill Trump’s White House with fear. Depending on the significance of the legislation, Trump won’t have much trouble getting his agenda through the House. Democrats have already signaled that they’re ready to work with the new administration. They won’t hesitate to jump onboard a trillion-dollar infrastructure package or a protectionist trade deal. I am not surprised. I do feel bad for all those conservatives who went with Trump instead of Cruz because they imagined him first as an “outsider” instead of the moderate Democrat that he is. An evening pause: Make sure you watch this full screen. In many ways this video tour of ISS illustrates its magnificence and its failure. It is not an easy thing to build a house in space, and it is clear that we have done it here. At the same time, ISS hardly appears to be a comfortable vessel to live in during travel to other planets. Skylab was much more livable. Hat tip Phil Berardelli and Tom Wilson. President-elect Donald Trump has chosen Betsy DeVos, a wealthy pro-voucher Republican activist, to head the Education Department. Her record puts her dead center within establishment Republican Party circles. In related news, Trump has chosen Elaine Chao as Transportation Secretary. Chao was previously labor secretary in the last Bush administration, and also happens to be the wife of Senate Majority Leader Mitch McConnell. Once again, someone deeply linked to the establishment Republican Party. At the same time, both picks have strong links to the very conservative Heritage Foundation. President-elect Donald Trump has chosen a conservative Republican congressman to be Secretary of Health and a businesswoman to be administrator of the Centers for Medicare and Medicaid Services. The congressman, Tom Price (R-Georgia), has been a big opponent of Obamacare. Prior to the release of ESA’s preliminary report on the failure of Schiaparelli, the Italian space agency had claimed the problem was caused by the failure of a Romanian subcontractor to do sufficient simulations and testing. There is something fishy here, but I’m not sure what. That they didn’t do a test because they feared instigating an international incident with Russia does not seem right. In fact, this whole story suggests that the very management structure of ESA, designed to spread work to as many of its partner nations as possible, is the fundamental source of the problem. Hat tip reader Local Fluff. Using new drill technology scientists are now searching for the best place in Antarctica to obtain the oldest ice core ever drilled. More than a decade ago, the European Project for Ice Coring in Antarctica (EPICA) drilled the oldest existing core, which contains 800,000-year-old ice, from an ice dome in East Antarctica known as Dome C. The core reaches only as far back as the latter part of the Pleistocene epoch, when Earth began cycling between warm and cold periods every 100,000 years. Before 1 million years ago, the cycle occurred every 40,000 years (L. E. Lisiecki and M. E. Raymo Paleoceanography 20, PA1003; 2005), so scientists want an ice core that is twice as old as EPICA to better understand this transition. Digging such a core would cost about US$50 million and take several years, so researchers want to be sure that the location is optimal — with ice that is sufficiently deep but not melted at the bottom by geothermal activity. “It’s absolutely crucial to thoroughly investigate all options,” says Eisen. Enter a new breed of drill, designed to do fast, cheap reconnaissance instead of extracting a single, intact ice core, as previous deep drills have done. One promising location, ‘little Dome C’, lies just 40 kilometres away from the EPICA site — and is where the £500,000 (US$620,000) Rapid Access Isotope Drill (RAID) will start boring this month, led by climate scientist Robert Mulvaney of the British Antarctic Survey in Cambridge, UK. A narrow drill, RAID will excavate to 600 metres in about 7 days — compared with 5 years for a 3.4-kilometre core such as EPICA’s. And rather than extract a core, RAID will measure the ice’s temperature and collect chips of ice. Scientists will then comb these for clues from isotopes as to the age and temperature of the ice at the bottom of the sheet. There is competition here as well. Another more conventional drill operation, run by Chinese scientists, has already been drilling for several years and might actually obtain a core sample 1.5 million years old first. The European Trace Gas Orbiter (TGO), part of the ExoMars 2016 mission, has successfully transmitted its first images back to Earth. In the next months, the team will be starting preparations for the prime mission. “The test was very successful but we have identified a couple of things that need to be improved in the onboard software and in the ground post-processing», says Thomas. “It’s an incredibly exciting time.” Eventually, TGO will use “aerobraking” (skimming into the atmosphere) to slow the spacecraft down and enter a roughly circular orbit 400 km above this surface. This process will start in March 2017 and take around 9-12 months. The primary science phase will start around the end of 2017. CaSSIS will then enter nominal operations acquiring 12-20 high resolution stereo and colour images of selected targets per day. Madness: A nine-year-old autistic boy was denied a gold swimming medal in a special Olympics competition in Wales because he set a personal best time that was more than 15% better than his previous best. Rory Logan, nine, was competing in the Special Olympics Regional finals in Bangor, north Wales, and won the 50 metres race in 53.15 seconds – a personal best and smashing his heat time of one minute and three seconds. However, when it came to the medal ceremony, Rory, from County Antrim, was simply given a ribbon for participating instead of the gold he was expecting. The boy went on to win gold in two other races, for which he should be cheered, but that he was denied a medal because he did his best is beyond disgusting.The worst part of this story is that in the future this kid is likely going to sandbag his achievements in order to avoid getting punished for success. Scientists think they may have located the cause of the vision problems experienced by nearly two-thirds of all astronauts after long missions in weightlessness. Prof Alperin has been looking at another potential source of the problems – the cerebrospinal fluid (CSF). This helps cushion the brain and spinal cord, and can accommodate the changes when a person moves from a lying to a standing position. “In space the system is confused by the lack of the posture-related pressure changes,” Prof Alperin explained. The team performed high-resolution MRI scans before and shortly after spaceflights for seven long-duration astronauts. They compared the results with nine astronauts who flew into orbit for short stints on the space shuttle. The results showed that long-duration astronauts had significantly greater post-flight increases in the volume of CSF within the bony cavity of the skull that holds the eye, and also in the volume of CSF in the cavities of the brain where the fluid is produced. The sample size is small, and the study has not yet been peer reviewed, so these results must still be taken with some skepticism. Sadly, the one person who was not on this video who loomed over it as I watched was John Denver. He is still missed. 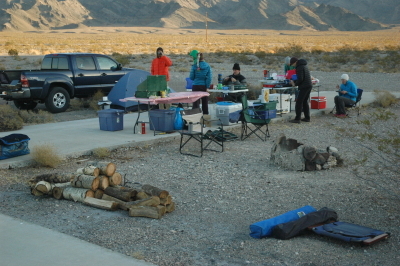 This past Thanksgiving weekend I joined some caving and canyoneering friends in Death Valley to celebrate the holiday in the great outdoors as well as explore some of the park’s more inaccessible canyons. We did not camp in the park, since campfires are not allowed and the park has a size limit for groups. Instead, we camped on BLM land just outside the park, in what appeared to be an abandoned RV trailer park that canyoneerers call Slabby Acres. First a primer. Regular readers will know that I have been doing cave exploration and mapping now for about thirty years. This recreational activity not only involves knowing how to use survey instruments in a cave, you need also to be trained in the vertical rope techniques required to reach some remote places underground, sometimes dropping multiple pits on the way in and climbing those same domes on the way out. Canyoneering is somewhat similar to caving. Just like caving you need to know how to travel over boulders and rough terrain and also know how to rappel and climb ropes. Unlike caving the canyons are open to the sky, and you rarely climb the ropes to travel up the canyon. In canyoneering the goal is to find the head of the canyon and travel down its many drops to come out at the bottom safely, all the while getting to see some wild, majestic, and rarely seen places. In addition, modern canyoneering rarely involves virgin exploration. Most canyoneerers visit already explored canyons whose details are well documented so that they know what ropes to bring as well as how to find the canyons. This was our goal this past weekend. Some of the western cavers who have joined my survey projects and learned how to cave survey are also active canyoneerers. While none of us had ever visited the canyons on our trip list, several were very experienced with finding and traversing places they had never been before. My plan was to follow them and enjoy the experience. Below are my pictures during one of this weekend’s canyoneering trips. The canyon is Scorpion Canyon. It was the first we visited and was relatively easy to do, only 4.6 miles long with only six rappels and only an 1,800 foot elevation drop. It would take us over one of the mountain ranges that form the eastern wall of Death Valley. In fact, this was how I was going to enter Death Valley for the first time. Rather than drive in, like most tourists, I would rappel in. It appears that SpaceX has definitely scheduled a launch of an EchoStar communications satellite for either January 8 or 9, and that this launch will follow the launch of 10 Iridium satellites in December. If this schedule happens has now indicated, SpaceX will launch a lot of rockets over the next two months. A new ESA report says that the ExoMars 2016 Schiaparelli lander failed because its navigation system thought the lander was on the ground when it was still more than two miles from the surface. Europe’s Schiaparelli Mars lander crashed last month after a sensor failure caused it to cast away its parachute and turn off braking thrusters more than two miles (3.7 km) above the surface of the planet, as if it had already landed, a report released on Wednesday said. Figuring out what caused this failure will be helpful for the design of the ExoMars 2020 rover, but the failure here is likely going to make it more difficult for Europe to raise the money needed for that next mission, including a 400 million euro cost overrun. Rocket Lab has revealed that it will not conduct its first test flight of its new Electron rocket before the end of the year. Rocket Lab originally scheduled road closures for test launches between November 17 and December 24. The company is now planning to conduct the first test flight early next year. Rocket Lab media spokeswoman Catherine Moreau-Hammond said the team had worked tirelessly this year, and with the holidays fast approaching they felt it best to allow everyone a decent break. Ms Moreau-Hammond said this would also alleviate some pressure on Mahia, which experiences a considerable population spike through the Christmas holidays. This is a new company, a new rocket, a new launchpad, in a new country inexperienced in rocket launches. It is therefore not surprising that things have been delayed. I have returned from Death Valley after a wonderful five days exploring four different canyons in this quite amazing place. I will do some catch up posting tonight and tomorrow, as well as post a description, with some pictures, of my experience rappelling down some of the rarely visited canyons of the park. An evening pause: Relaxing, especially a day after Thanksgiving. And you can simply let it play in the background while you work on other things on the computer. An evening pause: Be thankful for your ability to do great things, at the spur of the moment. I find it interesting that these thoughts have only been real and strong for me during the first and last thirds of my life. I definitely pondered such thoughts in my middle years, but they had no real meaning. In the middle years things seem to continue the same for so long, which means the concept of aging fades from view. However, when we are young and when we are old the fact that we age and change is very evident, and so, the beginning and end of life becomes much more real. For the next five days I expect to be completely out of touch with the internet universe. I and a bunch of friends are heading to Death Valley to do some canyoneering. We intend to explore a number of the slot canyons there that are rarely visited. It might be possible to get internet access, but I am not betting on it. We will be camping in some remote areas. And despite this, we also plan on Thursday to put together a potluck turkey dinner for everyone to eat. Should make for the most interesting Thanksgiving I have ever had. Thus, I wish now to extend to all my readers the happiest and most grateful Thanksgiving. May the coming year bring you joy and celebration, as well as many good surprises that make your lives better.